I feel as if I need to apologise for yesterday’s Cat Poo Cookie post. I merely want cookies I can share and know people will eat. Plus, these cookies are a cookie that Australians seem more willing to eat than Halloween pumpkin cookies. Also , Peanut butter. Yes, you know, peanut butter makes an appearance in all my books, which, by the way you can check out here and buy. With an electric mixer on medium to high, beat butter and peanut butter speed for 30 seconds. Add the sugar, brown sugar, baking soda, and baking powder. Beat until combined, scraping sides of bowl. Stir in any remaining flour. Chill dough 1 hour. Shape dough into 1” balls. Roll balls in additional granulated sugar to coat. Place balls apart on an ungreased cookie sheet. Using the tines of a fork to flatten balls, making crisscross marks on top. Bake for 7 – 9 minutes or until bottoms are light brown. IF you wannna make these and add a Halloween spin, Add 1 cup of semi-sweet chocolate chips. 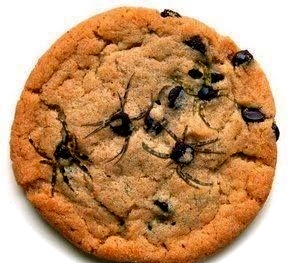 When you remove cookies from the oven, use a toothpick to make ‘spider legs’ from a melted chocolate chip. SCARE ALL YOUR FRIENDS!